So Fuerteventura consists mostly of old volcanoes, stones, sand dunes, palm trees and a few dry brittle bushes. It is a dry, windy and rough island, and most charter tourists are flown down to the other lusher Canary Islands for their holidays in the sun. 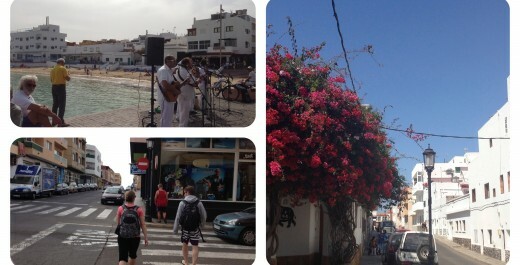 But the thing is – Fuerteventura has charm! And amazing beaches of course! And this is what many surfers worldwide have realized. The island is perfect for a getaway if you want to do water sports like surfing, kitesurfing, windsurfing, or for example learn spanish (as I did), instead of floating around in a crowded pool like a piece of meat in a soup at a gigantic tourist complex. This I noticed, especially in Corralejo, that a huge percentage of all the people I met were there for the same reasons as I was; they wanted to go to genuine place not overly exploited and to learn surfing, or they were pros who already mastered the wave riding technique but who said that there were some seriously great surf spots along the north shore of Fuerteventura worth visiting. And Corralejo. It’s an old traditional fishing village that now supposedly is the largest holiday resort on the island. Surprisingly it does not feel super touristic even though you can’t avoid hearing italian, german and english in town. You can walk everywhere and the town feels safe even at night. Corralejo is not a super beautiful, old, or architecturally amazing place…but even this little city has a much greater charm than its appearance. It is all in the atmosphere. Something that really appealed to me and my deeply hidden latino soul inside this nordic outer shell. You see groups of people, young and old, sitting on terraces eating, having coffee or drinks, in lively conversations waving their arms and gesticulating. Dogs are welcome too. They are everywhere and very well behaved, I must say. You sense that there is no extra un-necessary stress in the air. People are quite chill and relaxed (apart from when they are arguing…that’s when you should act invisible and walk on). Kids are playing football in the middle of town on a square surrounded by buildings, and the scandinavian part of me immediately wonders how many windows have been accidentally broken by those future Ronaldos and Messis… But who cares. The most important realization is that these people, the Fuerteventurians, know how to enjoy themselves and live in the moment. And it’s all in the air. And that’s why you get a bit smitten by this place just by breathing.